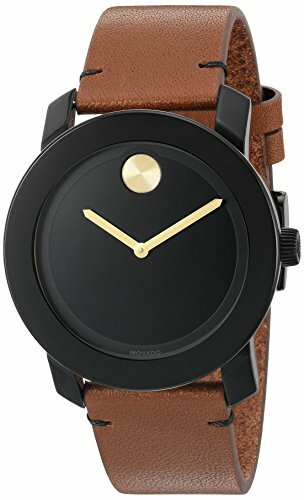 Get a sleek modern finish with some rugged appeal wearing the Movado® Bold watch. 42 mm round stainless steel and TR90 composite material case. Colorado bull hides leather wrist strap with black tack-stitch detail. Black dial face with yellow gold-tone sunray dot and hands. The Blue Angels are the Navy’s elite flight demonstration squadron renowned for their precision and grace showcased in each of their flight maneuvers. The same precision and grace is exhibited in this Citizen Promaster Blue Angels Skyhawk A-T timepiece. The 46mm stainless steel case features a blue dial with yellow accents and includes chronograph functionality, perpetual calendar, dual time, alarms, countdown timer, power reserve and pilot’s rotating slide rule bezel. Stainless steel case with a black leather bracelet with contrast stitching. Fixed bezel. Black dial with luminous hands and Arabic numeral hour markers. Minute markers around the outer rim. GMT scale. Date displays at the 3 o’clock position. Swiss self-winding automatic movement. Scratch resistant sapphire crystal. Skeletal case back. For the cycling fan this Special Edition “Vuelta 2017” watch is just the thing. The stunning case in stainless steel together with sapphire crystal completes the watch. So if you want to be on time, this men’s watch a good choice for you. It has a black rubber strap with red stripes. 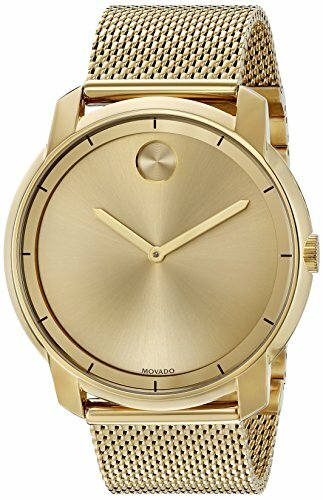 Add endless prestige to your look with the Movado™ Bold Thin watch. Yellow gold ion-plated stainless steel case. Yellow gold ion-plated stainless steel mesh-link bracelet with mesh-textured back sizing links and deployment clasp. Yellow gold-tone sunray dial with matching sunray dot. K1 crystal with a ring of gold-tone metalization and hour index. The I.N.O.X. a collection is engineered to endure a truly adventurous life. I.N.O.X. watches can handle extreme conditions such as a fall of 10 meters, being driven over by a 64-ton tank or a dive down to 200 meters. They were also designed to please the eye. Day or night, in the office or on a mountain, nothing beats the durable, versatile look of the I.N.O.X. collection. A sober and functional aesthetic, mixed with rich details. Authentic and understated, the I.N.O.X. The collection pays tribute to our history and Brand heritage with a name deeply linked to a material that made our success – Stainless Steel! A minimum of 100 quality control tests allows Victorinox Swiss Army to offer a 3-year warranty. To preserve the attractive appearance of the watch, regularly clean the case and the steel or gold bracelet in slightly soapy water, then rinse in fresh water and dry with a soft cloth. The leather is a noble, living material. When it gets wet it tends to lose its suppleness and color. If possible, avoid frequent immersion in water and daily showers. When the watch has been in saltwater, it should be carefully rinsed with clear water and dried as soon as possible. –Each watch sent to and authorized Victorinox Swiss Army (VSA) Customer Care Center is handled by a professional watchmaker. design combined with superior accuracy results in the expansion of the Citizen Perpetual Chrono A-T Collection, or PCAT, which syncs to the atomic clock for ultra accuracy. Featuring a granite ion-plated steel case with a charcoal grey dial with sapphire blue accents. Completing this multifunctional timepiece is a grey stainless steel bracelet with a fold over clasp with hidden double push buttons. Additionally, Eco-Drive technology allows your timepiece to charge in any light, eliminating the need for a battery.